The Medical Power of Light! Laser tattoo removal is the gold standard for the effective, safe, and fast solution for removal of unwanted tattoos. The lasers used in tattoo removal are small, and fire in rapid pulses. They take advantage of a process called photothermolysis, which is essentially the same process used in laser hair removal. The technology for laser tattoo removal has improved in leaps and bounds over the past decade, and now these advances in technology are available to you. 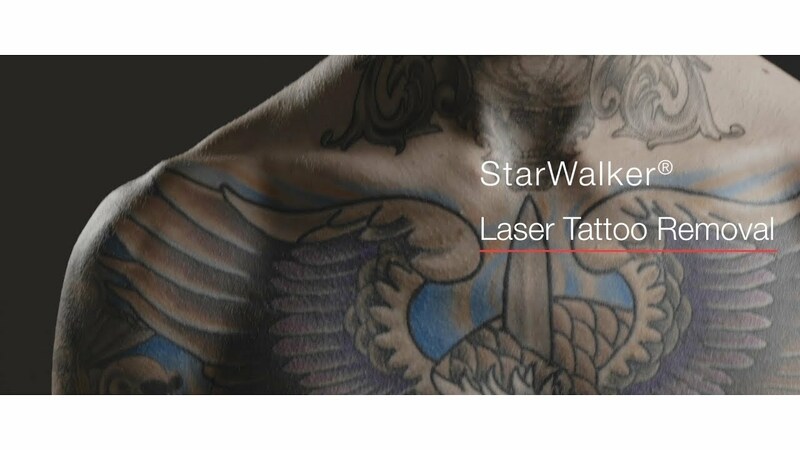 Utilizing the high performance Fotona StarWalker® laser system can result in removal of all common tattoo colors- even GREEN- 3x times faster than all other conventional laser treatments! When you get a tattoo, the needle itself creates tiny wounds in the skin. The ink runs down the needle and enters into those wounds. As the tiny wounds heal, the body sends white blood cells that attempt to absorb the foreign bodies- in this case the tattoo ink—and in the process, that pesky ink gets set into the skin. These tattoo inks tend to made from various compounds, including heavy metals such as manganese, copper, and lead. These compounds, when resting in body tissues such as the middle layers of the skin (called the dermis), are what actually give your tattoos their ‘permanence’. In order to remove these ink compounds, the pigments must be broken up into their smaller constituent parts. This is where the laser comes in. The patented StarWalker® laser system from Fotona utilizes extremely short and strong laser pulses to penetrate deeply into the skin without injuring the top layers. These pulses are absorbed by the pigments, mechanically stretching and breaking up the ink into smaller and smaller particles. The ink particles are then naturally absorbed by the body’s own immune cells, and are able to be transported to the liver and kidneys. The type and size of the tattoo will determine the number of treatments necessary in order to remove it from the skin. Different color pigments require different temperatures and wavelengths of light to break up. The results for both amateur and professional tattoos occur between the treatments, and you’ll notice the difference as the body slowly removes the ink particles and the tattoo slowly fades away. Fotona's StarWalker® Laser System The Power of Light!